After lumber processing, we get the timber. However, we cannot use this wood straight from the mill. As any woodworker knows, you need a variety of tools to make the wood look presentable. 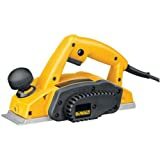 The best electric power planers are designed to help you remove the chips, misshaped edges as well as aligning the piece in line with the dimensions that you need. 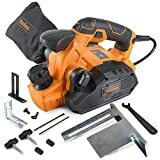 But, what is the best electric planer? Well, this is a multimillion-dollar question. While we have hundreds of products on the market, it is crucial to ensure that you have selected a model that will meet your needs. In this guide, we are going to review the most popular and high-performance electric power planers available on the market. This list will include the benchtop, handheld, and portable models. Go through each review to find a model that will meet your needs. DEWALT DCP580B is engineered to offer the user with high cutting capacity while remaining simple to use. This makes it a great choice for any woodworker as well as professional window installers. It features a brushless motor that not only ensures maximum efficiency but also assists to ensure constant speed under the load. Some of the other features worth noting about this model are its lightweight design, depth adjustment knob as a Poly V drive belt. The Bosch PL2632K is designed to offer the user with precise and fast cutting. This is one of the first electric planers to come with a lock on and lock off feature. This feature will not only prevent accidental startup but will also provide the much-needed hand’s free operation when using for an extended period. Some of the other features we love about this unit include the spring-loaded stand powerful motor as well as dual fence feature that ensures a non-flexing guidance. 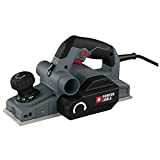 You can now plane away splinters, chips, and misshapen edges effortlessly with this electric planer from WEN. It is an excellent choice for fitting wood and fixing stubborn doors. Don’t underestimate the performance of the 6AMP motor as it offers over 34,000 cuts per minutes. This will allow you clear all the irregularities for a smooth and well-aligned fitting. What’s more, this unit comes with an adjustable depth that has to 16 positive to ensure precision. The Porter Cable PC60THP is a high performance corded planer that is fun to use for both beginners and professionals. The models are surprisingly lightweight despite being powered by a powerful motor that offers sufficient torque for maximum performance regardless of how demanding the task is. The model is constructed using sturdy yet lightweight materials making it easy to transport. Additionally, this unit comes with a depth adjustment feature with ten positive stops to ensure precision and accuracy. Makita KP0800K offers the users with an incredible performance that they will love for years to come. The unit is crafted from high-end materials that withstand repeated daily use. It is also fitted with a strong motor and high-quality carbide blade that makes the work done faster and efficiently. Besides, this model only weighs only 5.7 pounds, this ensures a high power to weight ratio, making it easy to control and use. 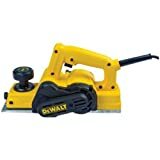 If you are serious woodworker looking for an efficient planer that has a faster removal rate, you will love this model. This planer is powered by a 7Amp motor that offers you with impressive results even on tough applications. Thanks to the high performance, motor, and 3.32 inches cut in each pass; this model will get the work done faster. In addition, this model is also compatible with reversible carbide blades that are great for a variety of application including framings and straight edge cutting. This is another great model designed to offer you a powerful motor and great cutting speed without breaking your bank. We love the spring-loaded stand that ensures that the planer remains in an elevated position where the blade will not be damaged. Another feature that stands out in this model is the ergonomic handle that reduces the user fatigue. This will help you work for an extended period without getting overly fatigued. 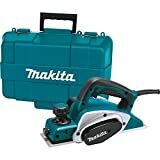 Makita KP0810 electric planer will make every woodworker dreams come true. This planer delivers impressive cutting capacity and power while remaining incredibly easy to use. It is an excellent choice for woodworkers constructing window, framing, fine woodworking, and door installation. Some of the features that make this unit stand out include two blade cutter head, adjustable depth, as well as rigid aluminum housing. 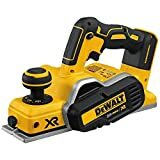 Make the work of fitting wood, fixing the door, correcting chips, and removing splinters simple by purchasing this electric planer. It boasts of an extremely powerful motor with a capacity of reaching an impressive 33,000 cuts per minute. 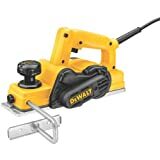 This model also comes with a cutting width of 3.25 inches allowing you to work on a large area in a single pass. Besides this unit, also come with ergonomic soft grip, auxiliary handle as well as a lock off switch. If you are looking for a tested model that will tackle heavy-duty applications and provide you with professional results, you don’t need to look further. This model comes with powerful motor and high-performance blades to ensure quick removal. Although this model is slightly heavier than another model, it offers you with more stability, which is crucial when dealing with heavy loads. Besides, the model also comes with all the accessories that will make your work easier.